Motto: Made by day, gone by night! Epic Fit Meals Co. is the pioneer of fit meals, offering essentially delicious, wholesome and balanced everyday meals that meet your eat-to-live needs while also indulging your live-to-eat spirit. The eatery's concept is Melbourne-inspired, offering the same multicultural range and quality cuisines using only best and most fabulous ingredients. They are all about simple, tasty food that you will love to eat everyday! All ingredients & dishes are delivered & prepared the very same day, ensuring that the food served is fresh; no sauces prepared nor meats marinated the night before. 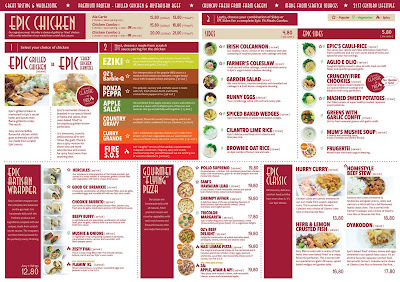 Every item is made to order - no cooking in large batches, nothing pre-cooked/reheated, not even their fruit juices! The 'extensive' menu for such an eatery! Keeps the food fresh throughout the delivery journey, just like how Domino's Pizza does their delivery. L->R: Agua Mello Smoothie (RM8.80/bottle - 61 kcal) - watermelon smoothie with fresh yogurt that's made in-house! Rich in vitamins A, B6 & C, it has anti-inflammatory & hydration properties. Classic Trifecta (RM7.80/bottle- 78 kcal) - carrot, apple & pear. Rich in vitamin A & C, and beta-carotene, this juice also detoxifies, aids digestion & energy boosting. Coolie Beauty (RM7.80/bottle - 41 kcal) - cucumbers green apple, ginger, celery & lemon. This juice is good for nourishing your skin & hair, alkalizing your body & it's also a beauty edible tonic in a bottle. Red Apple Honey Smoothie (RM8.80/bottle - 79 kcal) - apple smoothie with fresh yogurt & wild honey. Rich in vitamin C & aids in digestion & de-stressing. Top (clockwise) - Epic's Mashed Sweet Potatoes [271 kcal], Epic's Crunchy/Fire Chookies [233 kcal], Epic's Cauli-Rice, Epic's Frugertii [98 kcal], Irish Colcannon [122 kcal], Spiced Baked Wedges [132 kcal], Farmer's Coleslaw [33 kcal]. Interesting. It's not like the usual creamy mushroom soup, but hearty enough as a bowl of mushroom soup. Mixed coral lettuce, tomatoes, shredded red cabbage, orange & almond flakes in Epic's honey mustard dressing. Loads of fun & food with blogger friends! Yes, they have pizzas too!! Perhaps they should try burgers next :P My favorite pizzas were the simple Tricolor Margarita & Sam's Hawaiian Luau :D Love the thin crust & flavorful toppings. Every pizza has its unique taste, which was satisfactory. Awesomeness + chicken. We combined spiced lean chicken strips with mushrooms, green & bell peppers, & real mozzarella cheese. A luau (feast) of real mozzarella cheese, spiced lean chicken strips, onions & pineapples. Epic's Italian flag pizza with red tomatoes, white mozzarella cheese & green basil. It's a vegetarian delight. Delightful combination of pulled Australian beef, pineapples, onions, tomatoes & sesame seeds. A delicious taste of the sea combining flavors of fresh prawns, real mozzarella cheese, cherry tomatoes, & English parsley. Epic's Pesta Raya Special - Our original & special tribute to the nasi lemak & it includes spiced lean chicken strips, eggs, peanuts, anchovies, cucumbers, real mozzarella cheese, & of course our Fire S.O.S. Fiery pizza with minced chicken, real mozzarella cheese, onions, & caramelized apples. 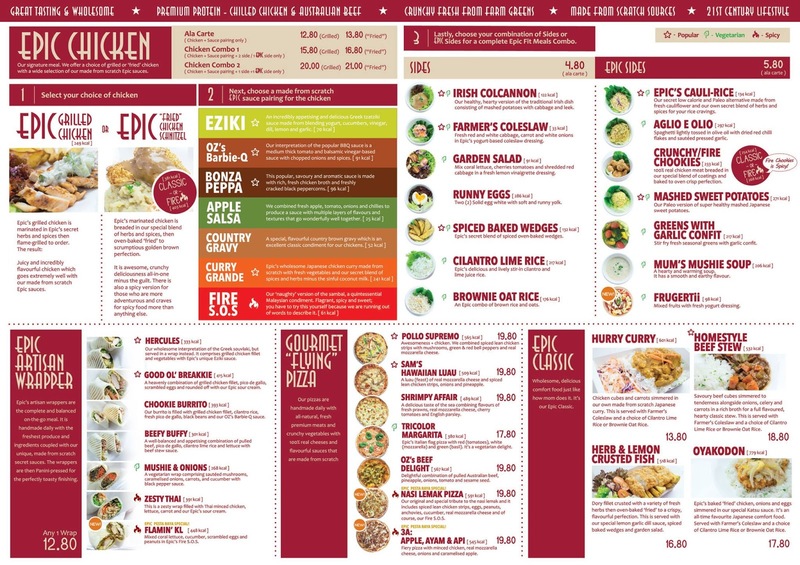 If you're avoiding carbs from pastries, bread & rice, Epic has a good variety of chicken meals with different sauces. Scrumptious golden brown crusted chicken breasts with Epic's interpretation of BBQ sauce: medium-thick tomato + balsamic vinegar based sauce with chopped onions & spices. The Japanese curry sauce is made from scratch with fresh vegetables & Epic's secret blend of spices & herbs minus the sinful coconut milk. If you want something simple yet satisfying, try the special, flavorful country brown gravy. This is Epic's 'naughty' version of the sambal, a quintessential Malaysian condiment. Fragrant, spicy & sweet! Those who love Greek tzatziki sauce will love this sauce - yogurt, cucumbers, vinegar, dill, lemon juice & garlic. Are you not impressed? Hahaha...looks super delicious, right? I felt that office workers could tap into their variety of wraps for lunch as well! Our burrito is filled with grilled chicken fillets, cilantro rice, fresh pico de gallo, black beans, & our OZ's BBQ sauce. This is a zesty wrap with Thai minced chicken, lettuce, carrots, & Epic's sour cream. Epic's wholesome interpretation of Greek souvlaki, but served in a wrap. It comprises grilled chicken fillet & vegetables with Epic's unique Eziki sauce. A heavenly combination of grilled chicken fillet, pico de gallo, scrambled eggs & rounded off with Epic sour cream. A vegetarian wrap comprising sauteed mushrooms, caramelized onions, carrots, & cucumbers with black pepper sauce. Apart from the above, they have combo meals from RM15.80 - 21.00/set as well as Epic Classics of Hurry Curry, Home-Style Beef Stew, Herb & Lemon Crusted Fish, & Oyakodon. 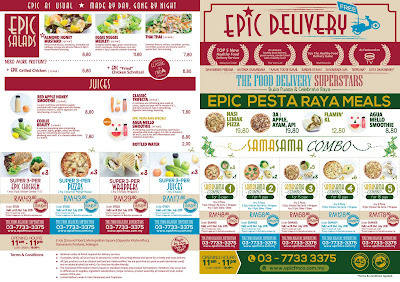 They also have Buka Puasa/Raya combo meals starting from RM48.80 (combo for 3 pax) - RM178.80 (combo for 15 pax). Ah, Epic As Usual! Love the variety, the freshness & the flavors! Give it a try & you'll know what I mean. Home-made: Granola Bars - Simple, Delicious, Healthier Snack Compared to Potato Chips! I had a sudden craze for granola bars, especially since I still have some packets of nuts that I purchased some time back. 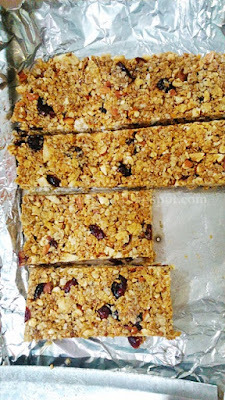 My first 2 attempts for home-made granola bars late last week was such a success that I was self-motivated to make even more bars, but with rolled oats this time around. The recipe that I followed as a guideline is from a blog site called Inspired Taste. As I'm a rule-breaker when it comes to cooking, I go according to the "agak-agak/feel" method, while having a recipe as the base. 2. Toast oats on medium flame until the oats have a slight brownish-look/'til there's a slight aroma of the toasted oats. Transfer to a large bowl. 3. Add the slightly crushed cornflakes to the toasted oats. 4. Toast the coarsely chopped nuts on medium flame until the nuts turn light brown/have a slight nutty aroma. 5. Add the toasted nuts to the oats + cornflakes mixture. Mix all ingredients well. 7. Pour butter mixture in to bowl with toasted oats and almonds. Mix well. Let cool about 5 minutes then add cranberries and a 1/4 cup of the mini chocolate chips. Stir to combine. (The chocolate chips will most likely melt a little. This is fine, they turn into glue and help to hold the bars together). 8. Transfer oat mixture to lined pan then use a rubber spatula or damp finger tips to firmly press the mixture into the pan. (Press hard here, this way the bars will stay together once cooled and cut -- We press for about one minute to be extra safe). 9. Scatter remaining 2 tablespoons of chocolate chips over pressed granola mixture then use a rubber spatula to gently press them into the top. Cover then refrigerate at least 2 hours. 10. Remove block of granola mixture from pan then peel away aluminum foil. Cut into 12 bars/however large or small you personally prefer. Overall comment: Delicious, flavorful & satisfying :D I guess having pork as part of the soup base helps elevate the flavors to the next level. Thai boat noodles aren't foreign to Malaysians. I remember the time when the craze just started; everyone just wanted to have Thai boat noodles & every other person raves about how many bowls of noodles they can eat to satisfy their cravings! Interestingly, Nine Bowls at Publika was a pleasant surprise. Portion isn't as small as the boat noodles I had at Cyberjaya & the soups were "oh-so-flavorful"! I didn't add these at all as I felt the soup was tasty enough on its own. They only had a minimal selection of drinks, so we had the usual Thai ice tea & a lemonade. No complaints. I love this the most. It has a well-balanced taste of pork bone broth, perfectly salted/seasoned with a tinge of sweetness. The crunchy beansprouts & veggies gave a whiff of freshness to the comforting bowl of noodles. If you're not a fan of pork, they have beef noodles as well, which was equally flavorful! The beef broth is intense enough to give it an "umph!" factor for a simple bowl of noodles. Yums. It's slightly too salty, but it's really delicious. I love pepper pork soup with salted vegetables. In fact, my mum, sis & I used to order pepper pork soup with rice at least once a week when we stayed at our old house! 9Bowls just needed to soak/wash their salted vegetable to reduce the saltiness & this dish will be a winner! If you're not too keen to try different flavors, you can opt for the value meal, which is a large bowl of boat noodles, equivalent to 6 small bowls of boat noodles! It's RM1.60 cheaper than having the 6 small bowls...hahaha...Ah, pepper pork noodles...large bowl...noms! To conclude our tasting session, we tried their Thai coconut jelly, which was a good, sweet ending to the dining experience. It may seem to be a very simple, nothing special sort of coconut jelly, but if you love the sweet & fragrant Thai coconuts, you will not want to miss this. Fans of Thai boat noodles, I would say this is one Thai boat noodles that you have to try! Note: Shop faces outside, not inside the shopping mall where B.I.G. is located.